Escape-Central - HOW LONG ...? Escape-Central > ESCAPE TRIBUTE FORUMS > General Chat > HOW LONG ...?
. . . Did You Wait ??? Posts: 104 How Long Did You Wait? :ff Ford appears to have finally come to their senses and increased production because of the long waits and demand for Escape's. So I'm guessing that the wait times should be decreasing now. How long did everyone have to wait for their Escape (or Tribute) to come in. I waitied just a couple days over 11 weeks. The wait didn't bother me till the last 2 weeks or so just waiting to get that call. My dealer started in with the "We can't deal 'cause we can't keep 'em on the lot." routine. I informed him that the 'Scape I wanted had been collecting dust on the lot for 30 days, that I knew of. He decided to negotiate (all the way to closing time) and I took it home the next day. The journey has just begun . . .
Bought mine straight off the lot. Used the Xplan (which i found on here, thank you to whoever put a link to the form) got what I thought was a good deal and drove away happy that night. ...saw "Little Vader" on Monday and was driving him home on Tuesday. AAAARRRRGGGHH. Still waiting here for my DSG Sport after 8 weeks. I know its really not THAT long, but it seems like an eternity!! To make matters worse, the local dealer that had one of these on their lot sold it yesterday so I can't drive by and gawk at it anymore. However, this Thursday is Ford's scheduled delivery date for mine, so we'll see how things are in 3 days. Keeping my fingers crossed! Well, in complete contrast to my earlier post, IT'S PARTY TIME!!!! The dealer just phoned me and let me know that my Escape is in and ready to go. Man, talk about an excited little camper today! Gone-2k2 Tribute ES-V6 4WD + Luxury Package, Towing Package, Side Airbags, all weather mats. Without ever having seen it, we called the salesman who had it cleaned up and waiting for us when we arrived after work one evening. Took it for a test drive (not my first one of an Escape), came back, thrashed out the price, and came to a good agreement. It really helped that we had bought an Explorer there 5 weeks before...which was fun because they wanted to sell it MUCH more than we wanted to buy it. I ordered mine April 19th 2000 and it arrive on Sept 22 nd and ready for pickup on Sept 25th 2001. 5 months and 6 days. Now they didn't actually start to build the Cdn Escapes until August of 2000 so I guess I can't complain. 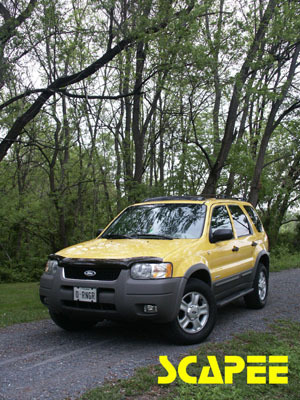 Anyone order their Escapes prior to April 19th, 2000? Toreador Red XLT Escape, Westin Safari Bar and Hella Lights, Ford Rear Spoiler, Ford Bug guard, Ford moulded splash guards, Cross Terrain Tires, Cloud Rider Chrome Grille, Donnelly Mirror auto dimmer, compass/temperature readouts & map lights. Specialized license plate, GPS and cell phone holder, Husky front floor liners, Walmart short black antenna, stainless steel door sills, chrome rear tailgate handle, Magnaflow stainless steel exhaust tip, GE886 50 watt fog replacements, Philips Vision Plus headlamp bulbs (H4), 50 watt replacement back up bulbs. Copyright � 2002 Escape-Central.com. All rights reserved. Board logo designed by Jen2002TBXLT. Disclaimer: Escape-Central.com is a personal site and is not affiliated in any way with the Ford Motor Company. Escape-central.com is not responsible for errors or opinions expressed on this web site. You should verify any and all information obtained or linked to from this website with your local Ford Dealer.